'How do I even begin to come to terms with this barrage of bad news?' So begins a journal entry I wrote in March this year after reading recent reports on climate change. In January, swathes of ancient forest in Tasmania had burned in bushfire. February 2016 was a scorcher — the warmest February in 136 years of modern temperature records, explained NASA, an unprecedented 1.35 degrees Celsius above the average. By late March I was looking at images of a bleached Great Barrier Reef and feeling similarly blanched of colour. I went for a walk, breathing heavily, looking at my feet. It was sunny. Ominously warm. Fifteen minutes later, when I returned to my desk, I'd dismissed everything I'd read. My mood was buoyant again, based on absolutely no new evidence. I turned off my computer, and threw the report I'd been reading in the recycling bin. I simply didn't want to know about it. This is my denial, the denial of someone who understands and accepts the reality of global warming, has made changes big and small to reduce his personal environmental footprint, but still needs to shut out the news reports just to remain sane. Then, in September this year, I watched another variety of denial play out, as newly elected One Nation Senator Malcolm Roberts gave his maiden speech in parliament. It's hard to overstate just how backwards and isolated this man's views are. Denying the basic facts of climate change means rejecting the consensus view of qualified scientists on the topic, every major scientific institution and all the world's governments. It's quite a feat of confirmation bias. "It's not the literal denial of Malcolm Roberts that will be a barrier in the future. That phase is over. It's the subtle, unspoken denial of people who fully accept the science, but deny the implications." What's most interesting, I think, is that Roberts has popped up in parliament at precisely the time his variety of denial has faded to the margins. Climate sceptics have always been a fringe minority in Australia. But due to the disproportionate amount of airtime and column space they get in the media, people think there are more of them than there actually are. If you ask people what view others hold on the topic, as a CSIRO survey did, they'll say 23 per cent of people think climate change is not happening. In fact, fewer than 8 per cent of people have that view. It's a tiny group. Plus, with the Paris climate change agreement in December 2015, there's now international consensus to curtail global warming, making Roberts' brand of climate denialism an embarrassing relic. Instead, we've moved on to a new phase of denial — the kind I've suffered from. What is denial? The late British sociologist Stanley Cohen described three varieties: literal, interpretive and implicatory. 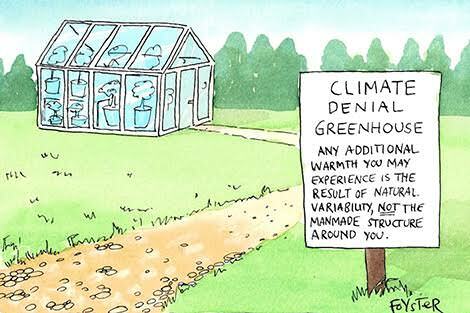 Literal denial is the blanket assertion that something did not happen or is not true (such as Roberts' rejection of the greenhouse effect). Interpretive denial is accepting the facts but giving them a different spin through euphemism, technical jargon or shifted emphasis. An example would be accepting that global warming exists, but arguing it's a good thing for some reason. Implicatory denial is something different, and much more interesting. It's when we accept the information, but suppress the 'psychological, political and moral implications that would conventionally follow'. This is the form of denial we practice when we're concerned about climate change but want to continue polluting behaviours like flying overseas for holidays. It's a way of letting ourselves off the hook. I know the feeling. That's exactly why I threw that climate change report in the bin — to protect myself from feeling scared or hopeless. For decades, researchers thought the lack of action on climate change was due to lack of knowledge. This concept was called 'the information deficit model'. 'If people only knew the facts!' went the catchcry as scientists, government agencies and environment groups presented the public with their most convincing statistics and temperature charts. It hasn't worked very well. Humans aren't spreadsheets with legs, weighing up the pros and cons of every action rationally. We're emotional creatures, and we interpret information through all sorts of filters — values, worldviews, identity, even social etiquette. We also have defence mechanisms to block out bad news. That's why the psychology of climate change, including how to deal with denial, will be crucial to our response. But it's not the literal denial of Malcolm Roberts that will be a barrier in the future. That phase is over. It's the subtle, unspoken denial of people who fully accept the science, but deny the implications because they're just too troubling to think about. People like me ... and maybe you. Greg Foyster is an environment journalist, an alumni of Centre for Sustainability Leadership, and the author of the book Changing Gears. Very perceptive. Implicatory denial is a protective mechanism and the emotions are very powerful. This article deftly skirts the money question. After all, the great majority of those labelled "denialists" readily agree that the earth has warmed – or, perhaps better, “defrosted”– somewhere between 1 and 2 degrees C since the end of the Little Ice Age in the 19th century, and also by a part of that since about 1960. (Check out notorious "denialist" sites such as Wattsupwiththat, JoNova, etc.) So the fact that only 8 per cent of Australians don't think climate change is happening AT ALL (CSIRO) is a rather irrelevant point to make if the author really hopes to skewer the great body of denialists as unrepresentative swill. It starts to sound like a broken record, I know, but: what denialists characteristically deny is the thesis that the scientific record shows that *dangerous* *anthropogenic* global warming is occurring. There are two essential components to that thesis: 1. That any recent warming is significantly human induced and 2. That this human warming is dangerous. But the Climate Institute's latest Report has it that "... a large 39 per cent (is) now saying human activity is the main cause" of global warming. Well, that means that 61 percent are, along with the denialists, NOT saying human activity is the main cause of global warming. So the thesis falls at the first hurdle. To put it another way: on this money question, most Australians with the denialists. The CI’s poll is consistent with but even more extreme than the last year’s CSIRO poll which found that deniers outnumbered warmists by 46.5% to 45.9%. What else can we do? We've marched, written letters and watched helplessly as the Adani mine gets approved a week after the Paris climate talks. To think about the consequences, especially on our children, is too horrible. Unfortunately, Greg, the images of the Barier Reef you were looking at apparently were not of the Barrier Reef. And records are muddled by data smoothing. Unfortunately, climate change has become a vehicle many people seek to manipulate for some perceived benefit. Hence the conflict over climate change. Humans are define as 'Rational Animals', capable of being motivated by feelings and also reason. Feelings are almost always present, but to be effective, Reason needs data to be available. When the data is abstruse, we tend to regress to what we might describe as our 'comfort zone', and try to carry on as we usually have in the past. This applies not only with climate change, but with many of the other changes affecting our lives, like social attitudes, migrations, and religions. Only when the 'Diehards' have passed on will the changes be really accepted. I always like to go to the source when HH quotes a reference. It helps get a clearer picture. This is from the Executive Summary of the Climate Institute’s “Climate of the Nation 2016” report: “Climate of the Nation 2016 finds that the majority of people who believe climate change is occurring continues to grow. In 2016, 77 per cent hold this view, up from 70 per cent last year, 66 per cent in 2013 and 64 per cent in 2012. Of these people, 90 per cent believe human activity is at least partly the cause, with a large 39 per cent now saying human activity is the main cause. Only 9 per cent blame natural cycles. In fact, in an ongoing and steadily increasingly trend, 60 per cent now either agree or strongly agree with the statement, “I trust the science that suggests the climate is changing due to human activities”, while 10 per cent are undecided.” It is an opinion poll and as such doesn’t really prove anything, but I don’t think we can use it to say most Australians are with the denialists. The full Summary of this interesting report is at http://www.climateinstitute.org.au/verve/_resources/COTN_2016_Executive_Summary.pdf . "It's the subtle, unspoken denial of people who fully accept the science, but deny the implications because they're just too troubling to think about. People like me ... and maybe you." Our city council is inviting residents to contribute to planning for the city's vision for the future. At a gathering last week I commented that in planning for the future we need to take account of climate change, mentioning that we had already had two 1/100 year cyclonic storms in the past 8 years, with much flooding and trees blown down. I was immediately told to stop talking like that, and that I should present the case in a more positive way. "So how can we talk about climate change in a positive way?" I asked and there was no reply. I think the speaker was right. People don't want to talk about climate change because it feels too negative. It is off the agenda. So, we will continue to contribute our ideas for our future together, based on the assumption that everything will be rosy. And we will just face cope the floods and cyclones and heatwaves and bushfires when they arrive. Brett, on the stats in the Report, as far as I can see, about 53% believe 1. That man is a cause but not the main cause or 2. that the cause is purely natural or 3. that there is no climate change. Only about 30% (ie 39% of the 77%) believe that man is the main cause of climate change. And to repeat, the percentage that believe man is the main cause of *dangerous* global warming must be an even smaller number. So on these figures, Australians' opinion is well and truly with the "denialists". But I agree with you that polls don't prove anything. At least we can agree on your final sentence HH but I think you are manipulating the statistics to support your views on climate change instead of drawing your conclusions from the Climate Institute data. The Climate Institute is not making the claims you make and in fact is saying the opposite. I can only repeat “in an ongoing and steadily increasingly trend, 60 per cent now either agree or strongly agree with the statement, “I trust the science that suggests the climate is changing due to human activities”, while 10 per cent are undecided.” Your view that if a respondent does not say human activity is the main cause of “dangerous” (your word by the way, it isn’t in Greg’s article) climate change they are right across town with the denialists does not recognise different levels of agreement. To “agree” rather than “strongly agree” does not mean people disagree with the statement. You are welcome to your opinions but in this case they aren’t backed up by the Climate Institute data. On Saturday 3 September, in Port Augusta, Yankunyjatjara Elder Edie Nyimpula King was keeping up the struggle, singing again the Seven Sisters inma, strong in its demands for a clean country and protection for the future generations. Its cry: Irati Wanti ... leave the poison! Have nothing to do with it! No radioactive waste dump in our country! But why is such responsibility for country and the health of its people forever so hard? Why is the destruction of country forever allowed to be normalised? Last year I sat in the offices of one of the judges of the International Criminal Court as we spoke about the possibility of ecocide law becoming an international crime against humanity. An international law against ecocide at its simplest is the criminalisation of mass destruction of the environment due to human action. At that time I heard that the obstacles were not legal, but political. Last week the ICC announced it may hold corporate executives and governments legally responsible for environmental crimes.